Gift Giving Superstar No Matter What the Occasion! 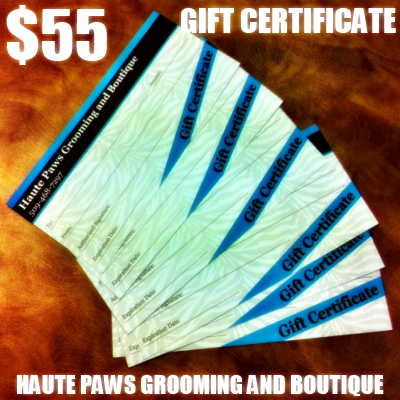 You Can Purchase Haute Paws Grooming eGift Certificates Below! 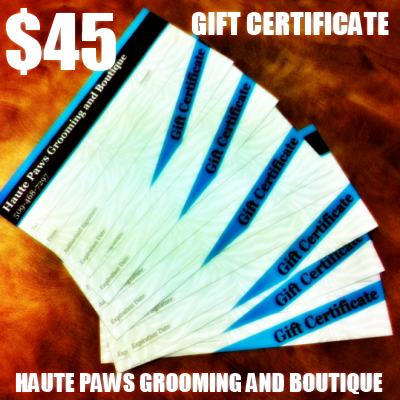 Haute Paws Grooming eGift Certificates make great gifts for you, your family and friends. ​We are excited to offer you the ability to purchase Haute Paws eGift Certificates here on our website! Choose from either a $35, $45, or $55 eGift Certificate. will keep the eGift Certificate on file by last name here at our shop. Please see Terms and Conditions are noted below. 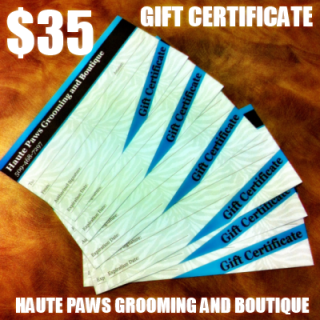 Terms & Conditions: Gift Certificates are good only towards complete grooming packages at Haute Paws Grooming and not individual, a la carte services such as nail trims, ear cleanings, etc. Haute Paws Grooming Gift certificates purchased online will be kept on file at our shop under the recipient’s last name specified by purchaser at time of purchase. Gift certificates are not redeemable for cash. Please note: Haute Paws Gift Certificates do expire. Gift Certificates and/or remaining credit balance, if any, are good for 180 days (6 months) from date of purchase. Sorry, no refunds. Terms & Conditions: Gift Certificates are good only towards complete grooming packages at Haute Paws Grooming and not individual, a la carte services such as nail trims, ear cleanings, etc. Haute Paws Grooming Gift certificates purchased online are kept on file at our shop under the recipient’s last name specified by purchaser at time of purchase. Gift certificates are not redeemable for cash. Any remaining Gift Certificate balance is tracked in our system, to be applied toward future complete grooming packages. Please note: Haute Paws Gift Certificates do expire. Gift Certificates and/or remaining credit balance, if any, are good for 180 days (6 months) from date of purchase. Sorry, no refunds.